Step 1 Trim the artichokes down to the hearts: Using a sharp knife, cut away the tough outer leaves until you see only light green at the base. Cut away about the top half-inch of the artichoke tip. Trim away the very tip of the stem, then peel the stem and base of the artichoke; there should be no dark green tough spots left, only pale green and ivory. (If there is a fuzzy choke inside, cut just below the choke to the base of the leaves and the choke will pop off, leaving a clean heart below.) Place the artichoke hearts in a large bowl of cold water with the juice of 1 lemon as you work. Step 2 Bring a large pot of salted water to a rolling boil and add the juice of the second lemon. Add the artichokes and cook until tender, 15 to 20 minutes. Step 3While the artichokes cook, heat the oven to 375 degrees. Butter a large gratin dish, about 11 1/2 by 8 inches. Step 4Drain the cooked artichoke hearts well and cut into 6 equal wedges lengthwise. Arrange in the dish in a single layer. Step 5Melt the butter in a small saucepan. Add the garlic and saute 1 to 2 minutes, then whisk in the flour. Cook until bubbly. Gradually whisk in the milk and cook, whisking constantly, until the mixture thickens and is smooth. Blend in the cream and heat through, then add the mustard. Season with three-eighths teaspoon salt and a pinch of pepper, or to taste. Step 6Pour the sauce evenly over the artichoke hearts. Combine the panko, parsley and cheese and sprinkle evenly over the top. Bake until the mixture is bubbly, 20 to 25 minutes. Serve immediately. In Recipes-list.com we have selected the most viewed recipes from category - Main courses Sides Vegetarian . Enjoy the best recipes specially selected for you! 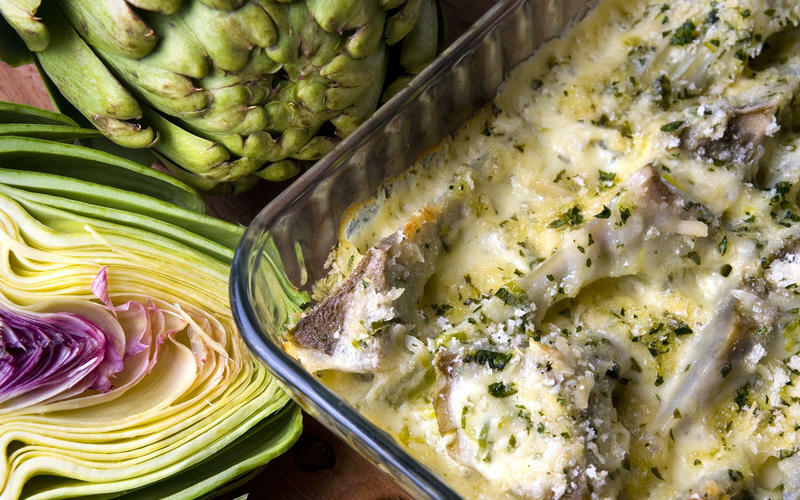 Artichoke and green garlic gratin is the right choice that will satisfy all your claims.